We at metal arc® offer a wide range of J Type Earth Clamps. 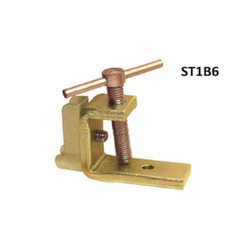 Our clamps can be made from Steel, Brass OR Copper as per clients requirement. Our wide variety makes us one of the leading manufacturers of Earth Clamps in India. Our products are reasonably prices and precociously machined to make sure they function well at the clients end. 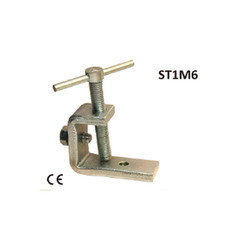 We offer an exclusive array of CE Certified J Type Earth Clamp ST1M6. 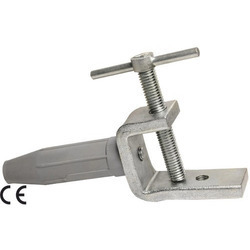 Our steel J type clamps with spindle are widely used in earthing/ grounding work and hugely appreciated by our patrons for their robustness and reasonable pricing. Under the stern direction of talented workforce, our offered clamps are manufactured using premium quality material with the assistance of modern techniques. In order to ensure their quality, these clamps are rigorously tested against various parameters of quality. Being a client-oriented organization, we are engaged in offering a distinct collection of CE Certified J Type Earth Clamp ST1M6i. These clamps are used for grounding/ earthing. Under the strict vigilance of talented professionals, the offered clamps are precisely manufactured making use of quality tested material and modern technology at our well-established manufacturing unit. Our provided clamps are carefully examined by our quality inspectors against set measures of quality to eradicate any kind of defect. 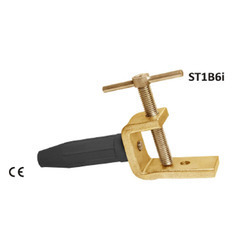 We feel immensely pleased to offer an exclusive array of CE Certified J Type Earth Clamp ST1B6. Provided clamps are broadly used in fitting work and widely appreciated by our patrons for their robustness and exact dimension. Under the stern direction of talented workforce, our offered clamps are manufactured using premium quality material with the assistance of modern techniques. In order to ensure their quality, these clamps are rigorously tested against various parameters of quality. Being a client-oriented organization, we are engaged in offering a distinct collection of CE Certified J Type Earth Clamp ST1B6i. These clamps are used ground conductors to pipes, tubing and grounding rods. Under the strict vigilance of talented professionals, the offered clamps are precisely manufactured making use of quality tested material and modern technology at our well-established manufacturing unit. Our provided clamps are carefully examined by our quality inspectors against set measures of quality to eradicate any kind of defect. Looking for J Type Earth Clamp ?